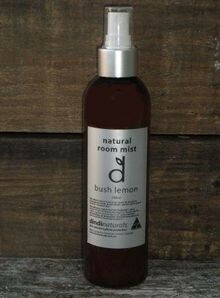 This is a great alternative to common synthetic room sprays that can give you a headache. Our room mists are made from a base of natural hydrosols, a bi-product from the steam distillation of plant essential oils. We add pure essential oils and an emulsifier and voila - a fantastic all natural room mist - suitable for bathrooms or any room that needs refreshing. Bush Lemon has a fresh, natural lemon eucalytpus scent, reminiscent of the Australian bush. Simply shake and spray around the room.